This image is what I see most mornings when I pop off the train to pick up a nub of cheese at the Fair Food Farmstand in Reading Terminal Market. The Market is an old train station, and in it, this stand is the nexus of local food. On March 13, the stand hosts its biggest fundraising smash, Brewer’s Plate – a feast of local beer and grub, the best Philly has to offer within 150 miles. You can meet me there (it's at the Penn Museum). And meet the local cheese intelligensia. Here’s a little primer, for all you red-carpet dairy dreamers. Cheesemonger Paul Lawler will no doubt wearing a smart suit. Paul, pictured below, is the most knowledgeable person I know about local cheese. Last summer, we drank whey together (a heinous experience; sorry, Paul) while he was “babysitting” Keswick Creamery. You can also meet veteran cheesemaker Sue Miller, maker of Birchrun Blue, along with the much-lauded Jonathan and Nina White form Bobolink Dairy – one-time cheesemakers to the White House. So, if your Oscar party is a letdown and you want a little red carpet action with the guys from the dairy case, get in on the sizzle. And the oysters. And the snifters of Root. I’ll be in the Speakeasy, munching Bobolink. Let’s find each other and talk rennet. Stop by the Farmstand on Friday between 4 p.m. and 6 p.m. for a taste of what the Brewer's Plate will bring. The Foodery will offer local beer and Paul Lawler will let you nibble wheels of Bobolink Drumm, Valley Shepard Fairmount, and Keswick Tommenator. Good, because I need to tell you about my Ginepro problem. I have some in the fridge, and I can’t stop sniffing it. It smells like, well, a gin’n tonic – faintly, of course, but it’s there. I have found a cheese that smells like my favorite cocktail, which means, in my head, summer has begun. To continue reading, please visit the Di Bruno Blog. Full disclosure: This post is part of a paid series I write for Di Bruno Bros. every other Wednesday. For this month’s cheese tasting at Quince, we're planning a tasting of three milks (or tres leches): goat, cow, and sheep. What distinguishes each one? What constitutes an ideal pairing? I'll talk about the traits of all three and walk you through a 3-course tasting. Come join us on Saturday, February 26, 2011 at 4 p.m. As always, tastings are held at Quince Fine Foods, a small shop near my house in the Kensington neighborhood of Philadelphia. We roll out the cheeses Slow Food-style, one at a time with accompaniments. The last selection comes with a complimentary beverage. Tastings cost $12. All proceeds go to the store. Next month: It's not too early to sign up for the March 26 cheese tasting at Quince. We've paired up with New Holland Brewing from Michigan for a tasting of cheese and craft beer. Come join us for a sip of Dragon's Milk. Other Tastings around Philadelphia: Don't forget that it's still Winnimere season. The Garces Trading Company hosts a beer and cheese class with Philadelphia Brewing Company and the Cellars at Jasper Hill (the makers of Winnimere) on March 1 ($65). Reservations required. Di Brun Bros. 9th Street , March 5, 11 a.m.-3 p.m.
Di Bruno Bros. Center City, March 6, 11 a.m.-3 p.m.
Ardmore Farmers’ Market, April 9, 11 a.m.-3 p.m.
I’m going through a hard-cheese phase. Pecorino, Parm. They’re good picks for February. Why? They’ve got warm, nutty notes and toffee hooks -- so perfect for gray weather when what you’ve got is cheese and what you want is candy. Take Ragusano. It’s my favorite hard cheese in the fridge right now because it tastes – I kid you not – like movie popcorn. Drop a morsel in your mouth and you taste sea salt, then butter, followed by a hint of sweet corn. Ragusano came to my attention through the cheesemonger Ian Peacock, who has Fiore Sardo (a famous hard cheese) tattooed on his chest. When he said, “Madame, you must try this,” I knew I would swoon. I did. I can’t stop rifling through the crisper drawer for just one more sliver. Ragusano is one of the few cow’s milk cheeses from Sicily – home to sheepy Pecorino. It’s not as firm as a Pec, which is nice because you can actually cube Ragusano and toss them on a salad (the new crouton, n'est-ce pas?) or, hey, take them to work in a bento. This makes for a very good desk snack. Better than licorice but just as sweet-salty. Last night, I had a yearning for some bitter greens and pasta, so I sautéed a bunch of broccoli rabe with a few cloves of garlic, boiled up some orecchiette (translated from Italian, this means “little ears”) and tossed the shebang with plenty of olive oil, cherry toms, a squeeze of lemon juice, red pepper flakes, and Ragusano. Gorgeous. I think my post-Valentine heart throb might just be this raw-milk cheese. Ragusssano -- it sounds like the name of an opera villain, but it tastes like a lozenge, the only kind of lozenge you could ever want. It’s a cheese with reverie attached. And the best part? It goes with everything…pasta, cold cuts, Sylvester Stallone, etc. Next time I see a matinee at The Ritz, I am bringing cubed Ragusano and a flask of red wine. Ask any good cheesemonger about his cheese of the moment, and he will surely tell you “Winnimere.” If he doesn’t, you can be sure he’s hiding a stash in the back for himself. That’s because it’s Winnimere season, the time of year when the Cellars at Jasper Hill in cold Vermont first release their much-awaited oozer. Winnimere is one of those legendary artisanal cheeses that people clamor for, and stand in line for; it’s the Harry Potter of cheeses. Mythical. Delightful. A cheese for the imagination. Why? It’s wrapped in spruce bark, for one thing, which gives it a kind of fairytale quality. And the rind, well, it’s luminous. Imagine a harvest moon, encircled with mist. Are you with me? Are you lusting? Winnimere is a washed-rind cheese that is modeled after Forsterkase, a specialty of Switzerland that, translated, means “Lumberjack Cheese.” Think wool socks, stubble, and the smell of pine. Winnimere is the twee cousin of Forsterkase. There is less beefiness and more forest magic. Winnimere smells like the cabin before the Three Bears arrived. It smells wild, like damp firewood, and tastes subtly of musk melon, caramelized onions, and toasted nuts. This is a bold cheese that fires up quickly on the tongue, then dissipates. Etherial. Marvelous. The texture is pudding-like. Imagine a forest custard. If you took the smell of a damp morning hike and asked the Spanish chef Ferran Adria (confession: I am reading his biography by Colman Andrews right now. Delicious.) to infuse the smell into a mousse, that, that (!) would be the flavor. Cold, it tastes like fairy gelato. It would be best to eat Winnimere after a sauna, I imagine, peering out at the snow, while a herd of deer nibbled at the bark of nearby trees. Can you see it? Can you taste it? Formaggio Kitchen suggests pairing this raw-mik dream with Belgian ale. Kirsten Jackson over at the blog It’s not You, It’s Brie suggests throwing a Winnimere party. The ladeez over at cheeseandchampagne.com suggest serving it with an Allagash white, a New York Riesling, or Midas Touch. Can I recommend that you try it first with a spoon, without bread, without a beverage, wearing nothing but wool socks in bed while someone reads aloud a paragraph or two of Lord of the Rings in your ear? That, I think, completes the experience. Tip: If you live in Philly, you're in for a special treat. Di Bruno Bros. has ordered a special batch of Winnimere washed in local Root Liqueur, which should arrive later this month. Three special tastings (noted in a previous post) are planned for the public. Don't miss the chance to try this rare combination. I will be there, standing in line, shivering with anticipation. I've been working on a mission statement. I thought I'd run it by you. Any suggestions, my darlings? Hi, I'm Tenaya Darlington. 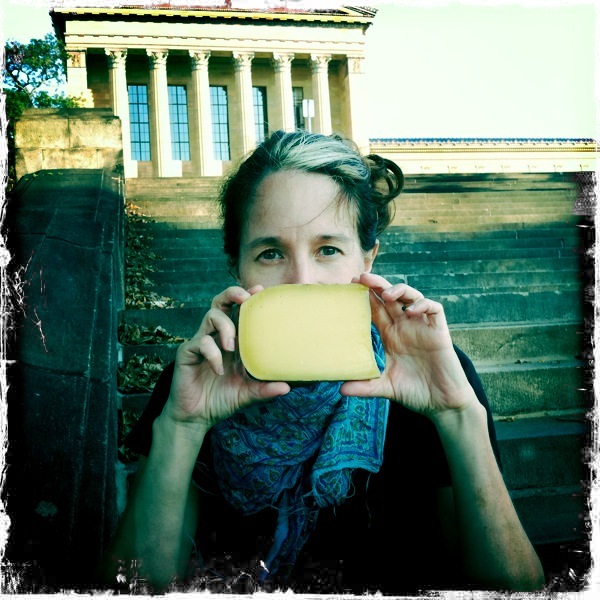 I started this blog in 2009 to document my love affair with strong cheese. My goal is to help the dairy curious become more adventurous. Ever tried Stichelton? It's one of my faves. I'm obsessed with photographing cheese, meeting dairy farmers, interviewing cheesemongers, pairing cheese, and introducing my friends to new bold beauties. I'm on the faculty at Saint Joseph's University, where Food Writing is my most popular class. Before I moved to Philadelphia, I was the Features Editor at Isthmus Newspaper in Madison, Wisconsin. There, I learned about the beauty of artisanal foods. This blog has helped me find community in a city that once appeared vast to me. In my neighborhood, I host monthly tastings at Quince, a local cheese shop. I also write a "Local Cheese" column for Grid Magazine. Best of all, I blog biweekly for the city's largest cheese counter, Di Bruno Bros. They pay me to write about cheese! The name "Madame Fromage" was inspired by a poetry collection I wrote in 2000, calledMadame Deluxe. I loved wearing velvet gloves to my readings. I couldn't retire them. So, Madame rose again. I also have a novel, Maybe Baby. Alas, neither book mentions cheese. My blog is designed to be a gateway into dairy lovin' and dairy literacy. I hope you feel welcome here. If you have a question, feel free to drop me a line. If you like what you see, you can find Madame Fromage on Facebook, Flickr and Twitter (mmefromage is my handle). Yes, that’s a cheese Swatch. Imagine my delight upon seeing it in the window of the Swatch store in Washington D.C.’s Union Station. It makes staying on time a pleasure, but my stomach growls every time I look at it. If you need a cheesy toast watch of your own, you can check them out here. Forty slots are open for 40 goat cheese lovers. Check out the Yellow Springs website if you want to sign up for award-winning cheese from one of Chester County’s most decorated cheesemakers. I wrote about my visit to Yellow Springs a few weeks ago and highlighted one of their cheeses, Nutcracker, in the current issue of Grid Magazine. If you live in Philly proper, you can pay extra for delivery through Panache, a company that delivers organic produce. Click here to register for the CSA. Cheesemonger Paul Lawler sends word of his new dairy case princess, Bobolink cheese. This is the first time that cheese from this much-lauded dairy will be retailed in Philly (woot, go Paul!). Paul writes, “I don't mean to be all star-struck, but well, I kind of am. Jonathan [White] was one of the very first on the east coast to really put fully grass fed dairy on the map, - supplying...the Clinton White house (where he taught the kitchen to make mozzarella).” Stop by the Fair Food Farmstand this weekend for a wedge. Hot scoop from the cave at DiBruno Bros.: the store has a secret supply of Winnimere that’s being washed in Root, a local liqeuer. It should be coming in from the Cellars at Jasper Hill in late February. Winnimere is a Vacherin-style cheese (read: oozy). Gorgeous. I want a Winnimere Swatch. Ian Peacock, a.k.a. Mr. Fiore Sardo over at Di Bruno Bros. (9th Street), is making morcilla and blood sausage at his new restaurant in the Italian Market, 943 South 9th Street. He’s a partner in the city’s first Latin-Italian meat laboratory. Given that he’s a longtime DB’s monger, you can be sure he’s serving up some pretty wicked cheese, too. The restaurant opened last week and is slated to start serving brunch, in addition to lunch y dinner. Last but not least, don't forget to mark Sunday, March 13 on your calendar for the city of Philadelphia's best craft ale and local foods dinner party. Tickets are still available, and Yours Truly is on board for some cheese cutting. Stop by, and I'll blow you a kiss. As March approaches, I am preparing for the blues. First, I thought about eating a different blue cheese every day and writing a post about it -- I mean, what else is there to look forward to in March? Then I realized that would be selfish, eating all those gorgeous cheeses by myself. So I had a thought: why not invite you to join me? Do you have a favorite blue cheese or blue cheese recipe? If you'd like to share it with the readers of this blog, I'll be happy to dedicate a day's post to you! This isn't part of any sort of promotion, just a private project -- something I've wanted to do for a long time. Sound fun? Drop me a comment or shoot me an email if you'd like to participate. Your photos don't have to be fancy -- you can even snap a few with your phone. Or, have your BFF snap a photo of you eating blue cheese. Be as weird/whimsical/whacky as you wannabe. The idea here is to celebrate robust cheese, so if you're new to the cheese scene, just pick out one that looks interesting. If we share our blues, getting through March will be a lot more bearable. Plus, I'd love to meet you! Last week, I received an interesting request from a reader named Mike Geno. He wanted my help selecting “attractive cheeses” – not to eat…but to paint. As a sample of his work, he sent me a jpeg of the image above. “A cheese painter?” I hooted, as I stood on the subway, reading his message. Then I opened the jpeg and squealed. Gorwydd Caerphilly! One of my favorite wedges! Within a few hours, Geno was in my kitchen and we were matchmaking. Man+cheese. Geno lives in my neighborhood, turns out, where he’s known as “Meat Man Mike.” A former butcher, he started painting steaks and cutlets after he graduated from art school, and now his career as an artist who paints food has taken off. He also curates a meat art blog, no joke. Check out his bacon drawings -- they are strangely alluring, as beautiful as koi. 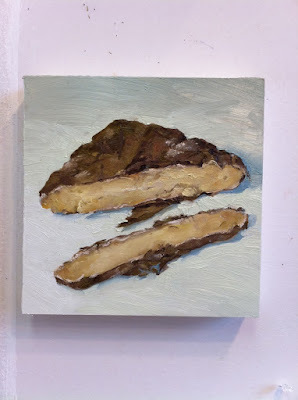 In June, Geno will present an all cheese show at the Seattle gallery, Cakespy (after the blog of the same name). Given the recent crackdowns on raw-milk cheesemakers in Washington state, this couldn’t be any more timely. In fact, I gave Geno my last sliver of Renata from cheesemaker Sally Jackson. Now that Jackson is no longer in business, I thought maybe a tribute to her 30 years of raw-milk cheesemaking might be cool to include in Geno’s show. I’ve promised to chronicle Geno’s cheese show as it progresses. 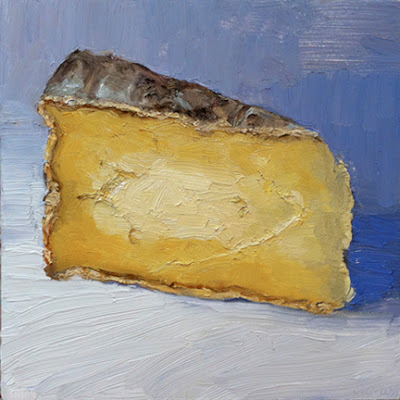 If you know of beautiful cheese he might consider painting, drop me a comment. Mike and I are planning to do a tour of some Philadelphia cheese counters next week. Incidentally, this is the second cheese-related art show I've heard about in the last three months. In December, the awesome cheesemonger Anne Saxelby hosted an art show titled "The Milk is the Medium" in Manhattan's Essex Street Market. It featured works by Hannah Sessions and Greg Bernhardt, a pair of painters/cheese makers who marry art and agriculture. Allow me to present my Cheeses of Longevity series: 3 cheeses that have more history than any human relationship. Eating cheeses like this can only bring good luck. To continue reading, please visit the Di Bruno Blog. Full disclosure: This post is part of a paid bimonthly series I write for Di Bruno Bros., one of my fave cheese haunts in Philadelphia.